How To Report Backdoor Roth In TaxACT. If you did a Backdoor Roth, which involves making a non-deductible contribution to a Traditional IRA and then converting from the Traditional IRA to a Roth IRA, you need to report both the contribution and the conversion in the tax software. For more information on Backdoor Roth, please read Backdoor Roth: A Complete How-To and Make Backdoor Roth Easy On Your Tax Return. For example when you are doing your tax return for year X, you report the contribution you made *for* year X, whether you actually did it in year X or between January and April of the following year. You also report your converting to Roth *during* year X, whether the money was contributed for year X, the year before, or any previous years. Therefore a contribution made during the following year for year X goes on the tax return for year X. A conversion done during year Y after you made a contribution for year X goes on the tax return for year Y. You do yourself a big favor and avoid a lot of confusion by doing your contribution for the current year and finish your conversion during the same year. Don’t wait until the following year to contribute for the previous year. Contribute for year X in year X and convert it during year X. Contribute for year Y in year Y and convert it during year Y. This way everything is clean and neat. If you are already off by one year, catch up. Contribute for both the previous year and the current year, then convert the sum during the same year. See Make Backdoor Roth Easy On Your Tax Return. The screenshots below are taken from H&R Block Deluxe desktop software. If you use H&R Block Online, the screens may be similar. In general you are better off with buying software installed on your computer, not the online service. See Tax Software: Buy Download Or CD, Not Online Service. You contributed $5,500 to a traditional IRA in 2018 for 2018. Your income is too high to claim a deduction for the contribution. By the time you converted it to Roth IRA, also in 2018, the value grew to $5,530. You have no other traditional, SEP, or SIMPLE IRA after you converted your traditional IRA to Roth. Income comes before deductions on the tax form. Tax software also organizes this way. Even though you contributed before you converted, the software makes you enter the income first. In this example, we assume by the time you converted, the money in the Traditional IRA had grown from $5,500 to $5,530. 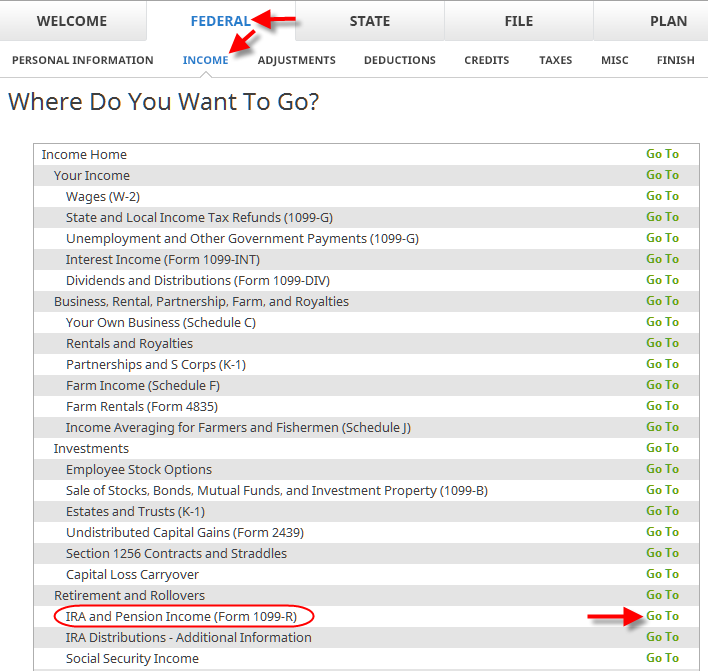 Click on Federal -> Income. Scroll down and find IRA and Pension Income (Form 1099-R). Click on Go To. Click on Import 1099-R if you’d like. I show manual entries with Add 1099-R here. Enter the 1099-R exactly as you received. Pay attention to the code in Box 7 and the checkboxes. My 1099-R had Box 2b checked, code 2 in Box 7. My 1099-R had the IRA/SEP/SIMPLE box checked. This is a very important question. Read carefully. You converted, not rolled over. You are done with one 1099-R. Repeat the above if you have another 1099-R. Click on Finished when you are done with all the 1099-Rs. Answer yes if you contributed for the year. After entering the Roth conversion, if you see your taxes go up a lot, don’t panic. In our test case we turned a refund of $941 into owing $995. This is normal. You haven’t entered your non-deductible contribution yet. It will come back down when you do. Now we enter the non-deductible contribution to the Traditional IRA *for* the year in question. Complete this part whether you contributed in the same year or you did it or are planning to do it in the following year before April 15. If your contribution during the year in question was for the previous year, make sure you entered it on your previous tax return. If not, fix your previous return first. Click on Federal -> Adjustments. Find IRA Contributions. Click on Go To. Answer ‘Yes’ if you contributed to an IRA for the year in question. If you contributed to Traditional IRA, check the Traditional IRA box. If you originally contributed to Roth IRA and then you recharacterized the contributions as traditional contributions, check the Roth IRA boxes here and then answer yes when it asks you whether you recharacterized. No deduction due to income. Contribute anyway. This is important. Answer ‘no’ to recharacterization. You converted, not recharacterized. See the difference in Traditional and Roth IRA: Recharacterize vs Convert. If you started fresh, enter zero. If you contributed non-deductible for previous years (regardless when), enter the number on line 14 of your Form 8606 from last year. This is another important question. Read carefully. If you are doing it the easy way, as in our example, answer “Yes” — you converted all. If you are doing it the hard way in offset years — contributing for year X in the following year and converting during the following year — answer “No” and you will see some more questions. Please, please, please do yourself a big favor and do it the easy way. See Make Backdoor Roth Easy On Your Tax Return. Just a note about Form 8606. Nothing to do here. A summary of your contributions. 0 in Traditional IRA deduction means it’s non-deductible. Repeat for your spouse if both of you did backdoor Roth. We are done for entering the non-deductible contribution to the Traditional IRA. Now the running meter for your taxes should go back down. It was a refund of $941 when we first started. Now it’s a refund of $930 due to the tax on the extra $30 earned before the Roth conversion. If you only contributed *for* last year but you didn’t convert until the following year, remember to come back next year to finish the conversion part. After going through all these, let’s confirm how you are taxed on the backdoor Roth. Click on Forms on the top and open Form 1040 and Schedules 1-6. Click on Hide Mini WS. Scroll down to line 4a. It shows $5,530 in Roth conversion, $28 of which is taxable. The taxable income came out to $28 not $30 due to some rounding in the calculation. If you are married filing jointly and both of you did backdoor Roth, the amounts here will show double. Tah-Dah! You got money into a Roth IRA through the backdoor when you aren’t eligible to contribute to it directly. You will pay tax on a small amount of earnings if you waited between contributions and conversion. That’s negligible relative to the benefit of having tax-free growth on your contributions for many years. 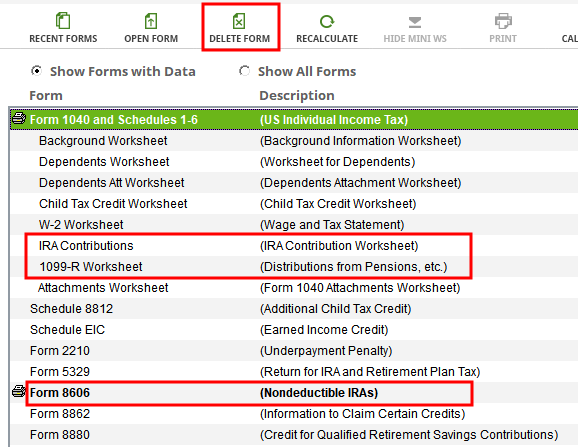 Click on Forms and then delete IRA Contributions Worksheet, 1099-R Worksheet and Form 8606. Then start over by following the steps here. I am absolutely a TurboTax defector for just the reasons you state and saved me TWO upgrades in the process and saved almost $100. I therefore appreciate any articles on using H&R Block effectively and will pass them along. I have a question about filling “Total IRA Basis” in your instructions and will appreciate any feedback. Is “Basis” to be used when I am converting IRA contributions from prior years? Will it only contain the amount that has not yet been converted but was reported in 8606 in prior years. E.g. if I have converted IRA contributions from 2013 and 2014 in 2014. So it looks like I’ll use basis to enter my 2013 contributions from 8606. But if I had already converted my IRA contributions from 2013 in 2013 itself, basis will be 0 even though I’ll have 8606 for non-deductible contributions made in 2013. If you contributed non-deductible for previous years (regardless when), enter the number on line 14 of your Form 8606 from last year. Assuming you did it correctly for 2013, if you only contributed non-deductible for 2013 but you didn’t convert in 2013, your 2013 Form 8606 shows the basis on line 14. Enter that number. If you contributed for 2013 and you converted it all in 2013, your 2013 Form 8606 had zero or blank on line 14. By the way, thanks for the great post. Just a week ago I ran into your similar post about Turbo Tax and desperately was looking for same information using H&R Block software. That’s when I subscribed to your blog and got a pleasant surprise today when this post showed up. I would love if you could give a walk through of how to do this in TaxAct. I’ve been using it for a while and am used to it, but would like to see how to properly file this. Oh wow, you are such a gem for publishing this. Thank you so much!!! Are the steps in the beginning of this (before entering the non-deductible contribution) the same steps needed to report a traditional 401(k) to Roth 401(k) conversion? Only the starting point is the same. The boxes checked or unchecked and the Box 7 code on the 1099-R are different, which bring up different screens after that. I would greatly appreciate any assistance you could provide for how to handle the following situation using H&R Block: 1) My wife and I each contributed $4500 to a Roth IRA in 2014/2015. 2) My wife and I realized our income was too high in 2014. 3) My wife and I opened a Traditional IRA and recharacterized our $4500 Roth IRA contributions (plus their earnings) as a Traditional IRA. 4) My wife and I then converted these Traditional IRAs to Roth IRAs a couple days later (the so-called “back door Roth IRA”. Thanks! I’m trying to do this in the HR Block web version of their software. I imported my 1099-R. The 1099-R lists the taxable amount in box 2a as the full amount of the withdrawal. When I go through the interview questions associated with this event in the software, it asks me if I converted the withdrawal to a Roth. I answered yes. Then, it later it gives me an error saying that the taxable amount must be zero since I converted to a Roth. Am I supposed to just override what is written on my 1099-R and put 0 instead? Does the 1099-R get filed with the IRS? If so, does my entry have to match what is written on the form. Any advise is appreciated. Someone else also brought it up. Please report it to HRB support as a bug in HRB Online. Until they fix it, just delete the entry in box 2a (don’t put in zero). That will let you move on. The check mark in box 2b makes the number in box 2a not as important. I don’t know what goes into e-file. The paper Form 1040 asks for 1099-R only if tax was withheld. The IRS has 1099-R from the issuer already. It’s best to match your entries to the form as you received, but what can you do if the software doesn’t let you continue? I need form 8606 because I made a $6500 non deductible contribution to a traditional IRA in 2014, then roll it into a Roth in 2014. H&R block skips part 1 and jumps right to Part II because it is checking the box right under the Part I heading, whereas the IRS instructions clearly state that I need to fill out part I. Why are embedded instructions in H&R Block form 8606 different than embedded instructions in IRS form 8606 ? Moreover, if I look at the H&R block worksheet that feeds into form 8606, there is a box in the worksheet that has $6500 and says that it is going to go to form 8606 part 1, line 1, which is where I expect it to go. Anyone else notice this or have an explanation ? It’s reading the 3rd bullet under the Part I instructions as saying Part I is not needed if you converted all and the first bullet as saying complete Part I only if you contributed but did not convert. If you fill out Part I it just takes you through a series of circular calculations — divide by a number and then multiply back. You end up with some zeros and the full converted amount anyway. I’m having the same issues with H&R block, It’s saying I don’t need to complete Part I since I converted all of my non-deductible contributions. Is there any way to override that? It’s clear from the instructions that I DO need to complete Part I. I understand that I get to the same place in terms of taxable amount ($0), but I’d still like to complete the form properly. Thanks for the great post! I couldn’t for the life of me get H&R Block to work before I read this post. Roger – I don’t worry about it. I believe H&R Block’s interpretation is acceptable. If you’d like you can try answering No to that “Did you convert all …” question. 3 bullets from IRS version of 8606 shown below. Not sure why IRS would not have been more explicit if I go by your interpretation, or why H&R Block could not have been clear on the discrepancy so that people like me would not question the H&R Block apparent deviation from the IRS instructions. If I override the checkbox, part 1 will be filled out. I do agree that overriding the checkbox in H&R Block or sticking with it checked results in the same final taxes. However, I wonder if skipping part 1 negates the goal of informing the IRS that you made a non deductible contribution in 2014. • You made nondeductible contributions to a traditional IRA for 2014. • You took distributions from a traditional, SEP, or SIMPLE IRA in 2014 and you made nondeductible contributions to a traditional IRA in 2014 or an earlier year. For this purpose, a distribution does not include a rollover, one-time distribution to fund an HSA, conversion, recharacterization, or return of certain contributions. • You converted part, but not all, of your traditional, SEP, and SIMPLE IRAs to Roth IRAs in 2014 (excluding any portion you recharacterized) and you made nondeductible contributions to a traditional IRA in 2014 or an earlier year. I keep hearing words like H&R Block interpretation is OK for its behavior with not filling out part 1, but I think a simpler explanation is that it is a bug. I went the route of online support. I don’t think the agent knew there was a form 8606. Agent took my info anyway. Someone called me a few days later. You would think they would have had the appropriate person call me. This agent didn’t seem to understand either. Did not know how to compare IRS part 1 instructions to HR Block part 1 instructions and see that they are different. Agent told me that I would receive a survey and requested that I document the issue in the survey. Wasn’t that her job ? Anyway, I did explain things again in the survey and never heard back. It could be. I also got tired of defending them. I will replace my examples elsewhere with a form produced by TaxACT, which looks more normal. Thank you for this website. I did my taxes on H&R online with the best of both where a CPA reviews it. When I entered the amount my husband and I put into our traditional IRA ($5500 each), the next page shows our non-deductible contribution as $0 and cannot be edited. When I go through the rest of the conversion questions, the Roth-contribution is penalized as an excess contribution to Roth-IRA over the income limits and also adds $11K to our income. Is this a bug in the system or did I screw something up? You screwed something up. Make sure you answer ‘No’ to whether you recharacterized your contribution to Roth, if you converted, not recharacterized. See Traditional and Roth IRA: Recharacterize vs Convert. I’m having the exact same problem with the H&R Block software, and the issue is not a mistake of clicking “recharacterize.” Naomi, were you able to get any help with this from H&R Block? I’ve been on the phone with a customer service rep for a half hour and it doesn’t seem like she has any clue! I just tried H&R Block online with a test account. Except it didn’t like a number in 1099-R box 2a, I had no problems. Make sure you already entered your W-2 or self-employment income. No earned income = not eligible to contribute to IRA, which can make it see your contribution as excess contribution. Thank you for your very helpful instructions. I have gone through them twice and still have a problem with the H&R Block software. In Form 1099R both box 1 and 2a have $11,000 because contributions to 2013 and 2014 non-deductible IRAs were converted to a Roth IRA in 2014. Line 15b on Form 1040 now shows $22,000 where I believe it should show $11,000. In attempting to fix this I followed your suggestion in a previous post by leaving out the $11,000 from the 1099R 2a box in my data entries. The H and R Block 1099R worksheet box 2a changed to $0 but the form 1040 line 15b continued to show $22,000. H and R Block support said the amount on form 1040 line 15b comes from the 1099R worksheet Line 2A, which is really a box. The only suggestion they had was to right click on the Form 1040 line 15b total and change it to $11,000. However this is an override and their assurances that the return is accurate are no longer valid and one can’t electronically file. Do you have any other suggestions as to how to tackle this issue? I have just compared an IRS 1040 with the H and R Block form. The H and R Block 1040 is a bit confusing with the numbering. H and R Block has a box in front of 15a, a box after it with a b showing to the right of the second box and then the 15b line in the column of other entries. So what I thought was an entry in 15b is actually an entry in 15a which should reflect the actual distributions shown on the 1099R. I believe the entry in 15a should be $11,000 rather than the $22,000 currently shown in the 1040 as discussed in my previous post. Sorry for my confusion. Thank you so much for posting this! These step-by-step instructions are extremely helpful! This page has truly been such an incredible help! I had been going through the TaxCut IRA sections again and again trying to figure this out, but getting nowhere. I had reached out to my investment advisor who was helpful in theory, but couldn’t help much in terms of the software specifics, or even regarding the accounting specifics of how to file. In desperation, I googled some keywords and this page come up as one of the first results—and in a matter of less than 5 minutes, I was able to achieve what I was fumbling with for hours. THANK YOU! My husband I are so lucky we stumbled across your article. Your instructions were exactly what we needed and they were easy to follow. Thank you so much! I performed a Backdoor Roth in 2014 with a traditional IRA basis of 0. After going through these steps, I took a look at my 8606 form. I see that line 1 (Nondeductible contributions to traditional IRAs for 2014) is blank. Is this correct? Does it not count as a contribution if it’s converted right away? Thanks very much for your helpful posts! It’s correct. See comments 10 and 11. Thanks so much for the reply, Harry! Now I can rest at ease :). These backdoor articles are super helpful; thank so much for doing them! Having the same problem as Naomi with the online program. H&R making it difficult as I can’t actually view the forms as far as I can tell. Any advice appreciated. Basically it seems it isn’t possible to have nondeductable contributions to a traditional IRA in the online software. It is zeroed out and no option to edit that. FYI Still could not figure out how to correct it in the online program. Even after trying to add an exemption to form 5329 section. I went to turbotax online which is much more straightforward and resulted in a several thousand dollar increase in refund. I tried H&R Block online. The interface is different but it still works. If you can’t figure it out, maybe just buy the desktop software and follow the steps here, or use TurboTax and follow the steps in my other article. Thanks so much for posting this. Very helpful! I wish I had known this earlier because now I will be off by a year. I plan to contribute *for 2014* IN 2015 and do the conversion for 2014 in 2015. As you have pointed out, this will get me off cycle. To get on cycle, then I will also contribute *for 2015* and convert for 2015 in 2015. Can you do an example of what the 8606 would look like for someone who tries to catch up? Based on what you posted, I think I understand how it should go for 2014 tax prep but given the catch up proposed in 2015, what would the 2015 8606 look like? Thanks again. It will look like this one in a comment on the other article. That reader caught up in 2014. You just add one to the respective years. Thank you for the very helpful information in this post and in your other posts. I did my contribution and conversion the easy way, for 2015. Unfortunately, I did it the hard way for 2014. I’m in the same situation as Comment #29 under the Make Backdoor Roth Easy on Your Tax Return post. Using the installed version of H&R Block Deluxe, I’ve carefully followed the information in this post (again, very helpful), but my Form 8606 Part I does not contain any entries. The entries in Part II are correct. I did verify the contribution and conversion were handled correctly by looking at Line 15A on Form 1040. T. J. Allard – If it’s otherwise correct, Form 8606 Part I being blank is not a problem. See previous reply to another reader. I previously read through those posts but I didn’t catch it at the time. So, I made tax prep hard and contributed $5500 to traditional IRA in March, 2015, for 2014 tax year. A few days later I converted it to a Roth IRA. I know now to never do this again and contribute and convert in the same tax year. Anyway, I entered the contribution as you stated in the “Nondeductible contribution” section. I have not received a 1099- R yet but will later in the year I am sure. So, I am confused as to what I should do. My tax owed went up, but do I just leave it and then report the 1099-R in 2015 even though it related to the contribution made for 2014 tax year? What are the steps I should do if this is the case? Your tax owed should not go up if you just enter a non-deductible contribution. You should find out why. You will get the 1099-R for 2015 next year. I spent an hour with the HR block folks on the phone and still can’t figure it out. My situation is that I contributed $1400 in 2014 but stopped because I changed jobs and my income exceeded the limits for a Roth contribution. This year (2015), I converted that original $1400 contribution to a non-deductable traditional and then contributed an additional $4100 for a total of $5500, which I converted back to a Roth. How do I account for this in HR Block online? Read “What to Report” section again. Tell it the way it happened. You contributed $1,400 to a Roth IRA. You recharacterized the contribution (not converted). You contributed $4,100 to a traditional IRA, but the contribution was made in 2015. Thanks–so I recharacterized the $1400 and converted the $4100? Since I recharacterized the $1400 into the traditional, would I report that I converted $5500 of the traditional to the Roth? Not on 2014 tax return. Read “What to Report” section again. I contributed $5500 to a traditional IRA in 2015 for 2014. I then converted it to a Roth a few days later in March 2015. So, in the section where I enter in my total basis for traditional IRAS (in your nondeductible IRA section above) , do I put $5500 as my basis in my traditional IRA since I am not reporting the convert until 2015 when I get my 1099-R? Read the on-screen instructions. It’s asking about previous years (years before the year for which you are doing the tax return). When I follow this(unfortunately I made non-deductible contributions in 2013 in april 2014, and then converted past april 15), it adds the IRA distribution to my income. Should I set the basis to 0 or what? Figured it out-forgot to enter a basis for last year’s contribution. Brittany – Your scenario has little to do with the subject of this article. Sorry I can’t help you. I am online doing my taxes free with H and R block and one of the tax questions that I am stumped about is Value of your Traditional IRA. Do I have to give the total amount that I have in my IRA? Please help! Yes, the total value of all your traditional, SEP, and SIMPLE IRAs from your end-of-year statements. Fantastic … thank you very much for taking the time to explain how to do back door Roth contributions in H&R. I will also follow your advice about making future back door contributions and conversions in the actual tax year. This was so very helpful, thank you so much for publishing this guide. Thank you very much for posting this. It was extremely helpful. Thanks for this very helpful guide. I contributed $5000 to traditional IRA in June of 2015, and then had to withdraw all deposited funds a couple of months later to pay for unexpected expenses. (I made $3 in interest by that time, also withdrawn.) Bank sent me 1099-R, with code “1” (not qualified withdrawal…). How do I convince HR Block tax form that this is just a reversal, and is not to be considered an IRA deposit/withdrawal at all? (According to pub. 590A, IRA contributions which are withdrawn the same year they are deposited are not considered as IRA contribution/withdrawal at all…). Do you know how to do these same screens for the State of New Jersey? Did you get answer on how to do this for NJ state? I am still struggling where program is calculating hefty taxes on it. Not sure if this is the right way as the questions don’t make much sense but I got it to show up as excludable IRA withdrawals on my NJ return, thus got the correct tax treatment. Hello, I tried to follow the same instruction steps for 2015 tax year using HRBlock deluxe, however, it does NOT show me the question for IRA->Roth IRA conversion in the interview steps, I used to see that in 2014 HRBlock deluxe, but for 2015, the conversion related question seems gone from the 1099-R interview steps as well as the IRA contribution steps. May someone please help here? Thanks! I just went through it in the 2015 software. The screens are more or less the same. In the “Distribution Rolled Over” screen, still answer “I didn’t rollover this distribution.” The conversion related questions come up next. Thanks for the reply. You are right. I missed the step to check box 7, “is the IRA/SEP/SIMPLE box checked”, once I checked that as yes, the conversion questions show up as demonstrated in your flow. Thanks. Thank you so much for this. I got so scared when I received a 1099-R showing a taxable distribution (taxable amount unknown) for what I knew to be an after-tax contribution and thought “Great…I tried to save a few $ extra for retirement and hurt myself in the process.” I couldn’t tell when I did the transactions in HRB whether I had done them correctly, and was about to throw in the towel and hire an accountant. Right before I closed the laptop, I decided to google the question and came across your article. I deleted my previous entries (which had actually been correct), wrote down the tax figure, and then followed your steps, watching the tax bill go up and then back down, just like you said it would. Even with following all of the steps above, my Part I on Form 8606 remained blank, and I was being taxed again on my $5500 non-deductible IRA contribution/conversion. I went through the steps in this post again and again, and I couldn’t figure out how to fix it and get the software to recognize that this was a nontaxable contribution. Eventually, I tried unchecking the box at the top of Form 8606 (right above Part I). The form does allow you to manually uncheck it. Once I did this, the software finally recognized that I had made a non-deductible contribution, and it filled out Part I (and the rest of Form 8606) correctly. You are one to fix my problem. Thanks a million! As I posted I have spent days on this one issue and only by unchecking the box you indicated everything all the sudden are good! can’t thank you enough ! The aggravation I had with HR Block for this one item every year makes me wonder if it is all worth it to save money to do my own return even though I am a CPA and know tax laws. The software is sometimes absolutely hard to work with. Jackie, we also had irritation with H&R Block last year as well as this year. The program works fine – I think turbotax is a little easier for the first few years, then H&R Block seems easier as things get more complicated. Last year there was a state form not included. The “help” people didn’t know anything about it and basically blew me off after I had tried to chase it down for hours. This year I needed to go from joint filing to Married Filing Separately because of a single non-resident return, and the only way to do it is to delete one taxpayer entirely (the wrong one!!) or restart all new. I called to ask if there was a way to do it and the “help” person informed me that he didn’t know the technical details of the program or whether this was possible. Another blow off. And that was after I spent 2 hours trying to figure out why my Trad to Roth conversion wasn’t filing correctly – one small box with lots of consequences! Finally got it. We might go to TaxAct next year and see how it works. The screenshots look much more barebones, so hopefully simpler architecture for a complex problem. Finally! An answer to my question. Thank you for this post! I spent hours trying to figure out why my non-deductible, converted distribution was showing as taxable on Form 8606 Line 18. It was that check-box! I had no idea you could manually uncheck the box. What a simple solution. This software bug is maddening. Thank you Gana! Hi, thanks so much for posting & updating again! We use this guide every year! 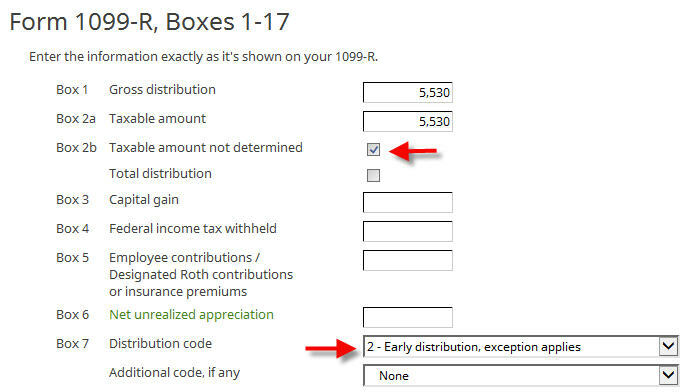 Question: My 1099R has two lines of numbers in boxes 1 & 2a — what does that mean? Or, more correctly, do I enter two lines in H&R block when there is only 1 box entry for Box 1 & Box 2 #s? Doing more digging… looks like I enter the sum of box 1, the sum of box 2, and then there are multiple distribution code boxes. However, when I try to do this, H&R says that codes G & 2a are not compatible. I’m going to enter each line as a 1099-R so I can work through the part that isn’t a backdoor Roth on its own. I just spent my entire today on making the backdoor IRA conversion to work and failed. It worked for me prior years but this year it is not working. The tax advisor worked with me for 2 hours and concluded that he needs to go back to tech support for me. I have been reporting exactly like what Harry Sit instructed and I am myself CPA but it is not working this year. The worksheet line 12 for some reason didn’t transport to form 8606 line 1 and I have my entire return finished without form 8606 generated. Getting help from HR Block has been impossible after spending whole day going around circle. After squaring away the Federal software bug , the conversion became taxable on NJ return. Give me a shout if anyone needs tips on NJ state return. I managed to make it appear as excludable IRS withdrawals on NJ return in the end. Hi Jackie – Thanks for the tips on the federal return. Now I’m struggling with NJ. Any tips? Hope you get this on time. HR Block Deluxe Online definitely has a bug. My $0 basis nondeductible IRA contribution, and full conversion to Roth were both in 2015, so this is the easy case. It doesn’t work, and I am charged taxes for the distribution. I’ll go through step by step since the screens are different than what is in this article. Page 5: Enter that I converted the entire $5,500 into the “amount converted” box, and click Yes for “Do you have a basis in your IRA” since I made nondeductible contributions. Page 3: Enter $0 as the total value of my traditional IRA, since it asks for the value as of Dec 31, 2015 and the conversion was made before then. HRBlock is wrong, they have 2 bugs. Enter the total amount you contributed to your IRA as the basis they ask for on page 7, and then you won’t get charged tax. The final tax return is still incorrect though since only Part 2 is filled out. As previously mentioned by others, if you followed the instructions for the 3 stipulations at the top of form 8606, you actually should have also filled out part 1. But the final results are the same. Did you have a W-2 entered already, with a large enough income and the retirement plan box checked? Maybe it thinks you are eligible for a deductible contribution to your traditional IRA. If you are indeed eligible for a deduction, the taxable conversion washes out your deduction. Also on your “Page 2: Your Nondeductible IRA Contribution Withdrawal” you shouldn’t enter anything. You didn’t withdraw your contribution if you converted. When I have the right box checked on the W-2, a box for “I was covered by an employer retirement plan in 2015” on the previous page is automatically checked, and the non-editable amount correctly shows as $5,500. Anyway, I find the installed software much better than the online one. If you can’t make it work with online, buy the installed software. It’s both less expensive and easier to use. I am still having the issue and hoped the software would have been updated for 2015. I made the $6500 contribution to the Traditional IRA (I am over age 55) for each myself and my spouse. I am retired and this put the $6500 into a deduction mode. My spouse is working and this put that $6500 in non-deductible mode. We converted both to a Roth (all this was done in 2015). No distribution was taxed. Summary: the $6500 was deducted (not sure if it should have) for the retired spouse. Of the $13,000 converted to Roth, none was taxed. In tax year 2014, no deduction was taken for any IRA and non was taxed (which was correct). What is wrong here …. should that $6500 for the retired spouse shown in the ‘deductible IRA’ zone? and if so, why doesn’t the 1099-R data showing the distribution get taxed to essentially void this out? Because you are retired and therefore don’t have a retirement plan at work, if your spouse has one at work, you have a higher income limit for taking a deduction than your spouse. If your income falls in between the two limits, it explains why your contribution is deductible but your spouse’s isn’t. You must have entered the distribution for your conversion wrong, thinking yours was nondeductible and you had a basis when it was actually deductible and you don’t have a basis. Background: I have been doing BDRs for my spouse for several years using HRB home edition software. So far, there have been no issues until now when attempting to do a BDR for tax year 2016. – I am the sole income earner; married filing jointly. – I am covered by a retirement plan; my wife is not. – I made a $6,500 ND contribution to my TRAD IRA on 1/5/16. – I made a $6,500 ND contribution to my wife’s TRAD IRA on 1/5/16. This IRA had no balance or basis. – I converted my wife’s TRAD IRA to a ROTH IRA on 1/7/16. There was no growth/earnings between contribution and conversion. – Received 1099-R reflecting the distribution of $6,500. – I followed your very helpful instructions from the 2015 Blog on BDRs using HRB software. Everything was consistent with your instructions except the software says the contribution to my wife’s TRAD IRS is deductible. Is that right? Do I get the benefit of a TRAD IRA deduction AND the ROTH conversion? If so, do I have to go back and change the ND contribution to deductible? Depending on your income, the contribution to your wife’s traditional IRA can be deductible. Make sure you have all your income accounted for. If you will receive more 1099 forms, by the time they come hers may no longer be deductible. Assuming hers is still deductible, if you take the deduction, the tax on the conversion will wash it out. Depending on her age and which state you live in, there may be a benefit on your state income tax. See Deduct-and-Convert: Save Hundreds in State Income Tax on Roth IRA Contributions. If that doesn’t apply to you, it’s just a wash either way: take deduction, pay tax on the conversion; don’t take deduction, no tax on the conversion. However, if her contribution was deductible, you have the choice of recharacterizing her Roth conversion and putting the money back into her traditional IRA. This way when you take the deduction you will reduce your taxes this year. Thanks for your quick reply, Harry. I think it makes sense in the long run to keep the conversion in the ROTH, without re-characterization back to the TRAD IRA. Since I declared the contribution as ND when I made it, am I required to go back to my custodian and declare it deductible (so it matches what I’m doing on the tax return? You didn’t declare it was non-deductible when you made the contribution. The IRA custodian does not know or care whether it’s deductible or not. If the software treats it as deductible because she can, make sure you don’t say she has a basis. See comment 45. I used this procedure last year to file my 2015 taxes using the installed version of H&R Block software successfully. However, using the installed 2016 Edition for this year’s return and using the same procedure above, I can’t seem to figure out how to get the program to not enter my converted ROTH amount as taxable on line 15b on Form 1040. I’m wondering if others are experiencing this same problem and that this could be a bug in the software? I used the same procedure in the installed 2016 Edition. It worked as expected. Thanks Harry. I meant to be entered as “non-taxable”on line 15b. I must be doing something wrong. I had to monkey around with the Form 8606 to get the correct taxable amount to show on line 15b of Form 1040 which is $28 due to the increase of value between the short time I funded the traditional IRA ($6,500) to the date of conversion ($6,528). The software automatically entered the amount of $111 for the cost basis that was imported from my last year return. I’m not sure if I should set the cost basis to $6,500 + $111 or leave it at just $6,500. I was delinquent in contributing to our IRA’s for 2016 and didn’t do it until February 2017. If I am reading this correctly, i do NOT report the ROTH conversion I just did in 2017 with my 2016 traditional contribution monies. I will report this in 2017? along with the conversion i will do later this year with my 2017 contributions?? Correct. You do report the contribution though. That’s what I did–many thanks!! Using H&R Block online to do my son’s taxes and he transferred his small ($2,544) 401K funds from Transamerica to a Roth IRA at another company. He got a 1099 from Transamerica showing code G in box 7 and nothing in line 2a. The 1099R from the receiving company shows code 2 in Box 7 and the Box 1 and 2a shows $2,544. The problem is when we put this information into H&R Block, it shows there may be duplication and it only gives us the option of calling the 2nd 1099R a regular distribution or an indirect rollover. It doesn’t ask us if there was a Roth conversion. I really don’t know what to do at this point. I have never contributed towards a Traditional or Roth IRA. I or Spouse dont have any IRA accounts. I have yet to file my 2016 tax return. To catch up, I plan to open a new Traditional IRA (for both myself and spouse, for 2016 year); I will likely convert to Roth IRA shortly but likely after filing my 2016 return. I will later this year also contribute for the 2017 year and convert to Roth before 2017 ends. (a) i just need to report my and spouse’s 2016 T-IRA contribution. Does this sound correct theoretically? I am looking at the 2016 HRBLOCK tax software now and doing a mock 2016 and 2017 return just to feel things out. My problem is that I lost money during the year, so I contributed $5,500 in 2016 and converted in 2016, but I had to pay a brokerage fee. At the end of 2016, I only had $5,172 available to convert. Therefore, when Form 8606 is generated, it shows that I have no taxable amount, but now have a total basis in traditional IRAs (line 14) of $328. Not sure how that can be when my traditional IRA account is $0? It’s OK. Don’t worry about it. The software will deal with it next year. Hello and thank you for a great article. I’m really hoping you can answer my question, since I spent hours researching with no results in sight. My scenario: contributed to traditional IRA (first time) this year for 2016 and 2017 and immediately converted. I don’r have a 1099R. This is the first year I’m using back-door conversion to ROTH due to income limits. Since I had no basis in traditional IRA for last year (since I didn’t even have traditional IRA to begin with), I answered “0” in HR Block software and it told me I wasn’t eligible for Form 8606 because I had no conversions. My 15a and 15b lines on 1040 are blank after I went through inputing my IRA contributions. Question: what am I doing wrong and what is required of me to file with IRS. Just do the second part starting with “Non-Deductible Contribution to Traditional IRA” for 2016. Some questions won’t come up when you didn’t have a 1099-R for 2016 (you will do that next year). I am wondering if I went wrong somewhere. Any advice is appreciated. If your income isn’t over the limit, making the Traditional IRA contribution deductible and making the conversion taxable will offset each other. If your income is over the limit, make sure you correctly entered your W-2 with the retirement plan box checked. I wonder if that is enough and in any case as long as the 8606 is filled out correctly I am good? This form apparently will not be available until later this week. I’m also wondering why after entering the same info in, I am getting a better return from TT than from using H&R Block software (free due to being below income limit). I suppose I am entering info in in error somewhere as they both should be churning out similar return estimates. To compare results between different software, print out the forms and compare line by line. I’m using H&R 2017 Deluxe. I followed the instructions – entered the 1099 IRA distribution as income and the IRA non-deductible contribution in the adjustments. It’s not zeroing it out on the 1040. I contributed 5500 to an IRA and immediately converted to a Roth…no earnings or anything special to deal with. Is there something different in 2017 that I need to do? Nothing different in 2017. If your income exceeded the limit, make sure you had the retirement plan box checked on your W-2. When you say it’s not zeroing out on the 1040, what does the 1040 show in lines 15a, 15b and 32? 15a and 15B are both $5500. 32 is 0. I noticed that form 8608 didn’t have the top section completed. If I manually updated line 17 (one of the only things you can update directly) to $5500 then it all seemed to work as expected. Am I OK making that change on 8606 – saying my basis is $5500? I didn’t have any prior funds in that IRA so I had entered 0. It’s better to delete everything related to your IRA and start fresh. Sometimes your previous incorrect entries get stuck. Delete your 1099-R, 8606, and any related worksheets. Start over by following the steps here. 1) It seems to me that I should be able to denote half the contribution for the year (my 1099-R shows a total of $11,000) as applying to 2016, but I cannot seem to figure out how to do this. 2) Line 15 of my 1040 shows the full $11,000 as being taxable, when I believe that none of it should be. If you really followed you should at least get the 15b amount down close to $5,500, i.e. having taken care of 2017. After that, just enter $5,500 in the Your Total Basis screen for your contribution for 2016. That will take care of the rest. Julia, I worked with H&R Block’s support on this, and they had me go into the 8606 form and under Part I and before line 1 there’s a box that says to check it if you meet both requirements. H&R Block support told me to uncheck that box and then it worked properly. They said they thought it was a bug. Harry, thanks, updating the total basis fixed the other half of the issue! I seen to have screwed up … but I guess this is how you learn. Until 2016 we did not hit the Roth Income limit and there was no complication. After stting down to do our doing our taxes, I found out that the AGI for 2017 falls inside the MFJ income limit where benefits are phased out. So I proceeded to do a backdoor Roth that I have been reading about in this and other forums for years. Last month, (February 2017) I contributed $5.5K + $5.5K to IRA for 2017 for both of us. A week after that (February 2017) I converted both the IRA’s to Roth’s. As I sat down to file 8606, I realized we don’t have the 1099-R because the IRA contribution for 2017 was made this year (2018). It was only after speaking to Vanguard, my mistake became apparent. The backdoor Roth conversion that I did last week (Feb 2017) applies to 2018 and not 2017. In effect, I made an IRA contribution for 2017 and a Roth contribution for 2018. Maybe this can be fixed next year when Vanguard sends me the 1099-R for 2018? Meanwhile, since there’s no 1099, I can’t even report the non deductible contribution this year on my online tax software. (In addition to the e-Filed returns) should I mail the IRS a hand entered 8606 for 2017 showing $5500 non deductible contribution in 2017 for each of us? What if I did a conversion of my 2016 traditional IRA contributions in March 2017 prior to filing my 2016 return? I initially reported it as converted on my 2016 return, but now I have a 5498 for 2017 that shows the distribution. Looks like I need to amend 2016 to show the traditional contribution (which results in a deduction), then report the 2017 conversion of the entire basis (no earnings involved). I would think this would result in my deduction from 2016 being reversed, but it looks like there’s a penalty or some other tax involved. You should report the conversion on 2017 return. If you used software, without a 1099-R, I don’t know how you could’ve reported the conversion on 2016 return. Your contribution for 2016 may be deductible or non-deductible depending on your income in 2016 and whether you participated in a workplace retirement plan. OMG!! You are AMAZING! Thank you sooooo much for this info!! Really really really appreciate it! Any advice for what to do if the software appears to have a rounding error in the pro-rata calculation? I contributed $5500 (non-deductible) in 2016 and 2017, for a total of $11,000. Converted $11,007 to Roth afterwards. Line 10 is 0.999 in H&R Block, which leaves me with 10,996 on lines 11 and 13, and $4 on 14. If lines 10 used 0.9994 (4 decimal places), I’d have a -0- on line 14, as expected. Did I do something wrong, or is this just the software? If I efile as-is with the $4 basis (and resultant $11 taxable gain) can I correct this later without paying any additional fees? Not worth worrying about. If you forget about the $4 and you don’t carry it forward, you pay tax on $11 versus $7. That makes your tax go up at most by $2. I don’t see the question for 12/31 balance in the series of screenshots here. If you had 0, maybe answer ‘yes’ to Convert All Your IRAs? Hi Harry – many thanks in advance for any help you can provide here. I’ve been trying to figure it out for a couple weeks now and am at the point of repeatedly jamming my head into my keyboard until it starts to make sense (proving unsuccessful thus far). Upon receiving my W2, I realized that I am within the phase-out limit for Roth IRA’s for 2017 and likely will be for 2018. In February 2018, I converted (or recharacterized?) $4500 of my 2017 Roth IRA contribution to a Traditional IRA and converted it back to a Roth IRA within a few days. Since I’m within the $118-133K income, I was allowed to contribute $1000 directly to the Roth IRA. I also converted (or recharacterized?) $5500 of my 2018 Roth IRA contribution to a Traditional IRA and converted it back to a Roth IRA within a few days. I’m using HR Block online to file my taxes. Can you please help me figure out how to approach my 2017 tax return given the conversion from Roth IRA -> Traditional IRA-> Roth IRA? The retirement box on my W2 was checked as well, since I contribute to a 401k through work. You recharacterized in both question marks. Do the second part starting from the “Non-Deductible Contribution to Traditional IRA” heading. Check the Roth IRA box because that’s how you originally contributed. When it asks whether you recharacterized, say yes and give how much you recharacterized. You will jam your head more next year but you have at least a year to prepare for it. Discover in Feb 2019 that I’m over $130k in 2018 and will be in 2019 as well. Since I had a old TradIRA I first transferred then entirety of it to 401k. Then opened a new blank TradIRA. Then I did a recharacterization in Feb for both amounts from Roth to that new TradIRA and immediate converted them back to RothIRA. Since I did both in 2019, what are my steps for filing in 2018 vs what I have to do for 2019? I expect a 5498 and a 1099-R next year about the recharacterization for the 2019 filing because of the gains of the 2018 funds before they were switched. So as far as 2018 filing…… do I only show the initial $5500 that was put into RothIRA at that time? You show the $5,500 originally contributed to Roth and subsequently recharacterized as contribution to a Traditional IRA. This becomes the basis you carry over to the following year. I’ve been dreading doing my taxes because of the complicated nature of this backdoor Roth situation. I followed your advice last year and now, I received two separate 1099-R’s from Vanguard this year – one for my Roth IRA for $10,650 (that I initially contributed to and then recharacterized) and one for my Traditional IRA for $10,800 (that I then converted back to a Roth). When asked “How much of your distribution did you convert or reconvert within 60 days of receiving the distribution?” I stated $10,800. Do I also say that I have a basis in my IRA? Then, when I got to the adjustments section, I checked both “I converted a traditional IRA.” and “I contributed to a Roth IRA.” I stated that my 2018 IRA contribution was $5500. I am then prompted to answer “Tell us about any withdrawn nondeductible contributions.” with a box for my nondeductible contribution and another box for the amount I withdrew, if any. What would I put for this? Lastly, what do I do with the 1099-R for my Roth IRA? It currently has Distribution code R written in box 7. (“Recharacterized IRA contribution made for 2017 and recharacterized in 2018”). A debt of gratitude to you for any help you can provide here – it is most appreciated! Archana – Your basis in the Traditional IRA from the previous year is the $4,500 you recharacterized. “Withdraw” means taking money out of the IRA to a taxable account. You didn’t withdraw any. Enter the other 1099-R with the R code as-is as a separate 1099-R and just follow the prompts. Thanks, Harry. When I initially recharacterized from the Roth IRA to Traditional, the value was $10,650. By the time I converted this back to the Roth, It had grown to $10,800. How do I represent this? Do I say that I contributed $5500 to my traditional IRA for 2018? Or higher than that? Archana – Both numbers are represented by the two 1099-Rs respectively. Enter them as-is. You don’t say you contributed $5,500 to your traditional IRA for 2018 because you didn’t do that. You contributed zero. You contributed $5500 to a Roth IRA in January 2018 for tax year 2018 and you recharacterized the entire $5500 to traditional IRA later in 2018. I have a 1099-R form from my employer associated 401K plan. I had contributed post-tax money to the 401K and converted the majority of it to a Roth 401K. So the money that I had already gained as interest is taxable and reported in line 2a. However the distribution code is listed as G. Per H + R online, this is a sticking point and can be in error, so I can’t proceed to e-file and must mail the return. Looking at the instructions for forms 1099-R says that a direct rollover of a distribution from a 401K plan to a designated Roth account in the same place, the amount rolled over in box1 $10,029.17, taxable amount in box 2a $184.03, basis recovery amount in box 5 $9,845.14, and use code G in box 7. So it seems that the form is correct. Is there any way around this or is my only option to mail it? I don’t know about restrictions on efile. I always mail mine anyway. Desperately need some help! In July of 2018 I rolled over an old 401K, from a previous employer, into an IRA. Then one month later, I converted that $2500 IRA to a Roth IRA. Fidelity sent me a 1099-R form for the rollover. Shouldn’t I also have a 1099-R form for the conversion into the Roth IRA since that is what is taxable? I’m using H&R Block online to file my taxes and I feel stuck at the moment. Any advice would be greatly appreciated! You should have one 1099-R from the 401k plan for the rollover, and another 1099-R for the Roth conversion. If both the 401k plan and the IRA are with Fidelity, the 1099-Rs are posted in different sections of Fidelity’s website (employer plan and retail accounts). In response to the latest reply. Is the first 1099-R I described the rollover from my 401K to an IRA and the second 1099-R described the conversion from the IRA to a Roth IRA? And lastly, do I just need to enter both of these forms under the income section of H&R Block’s online filing system and then I’m done with the IRA stuff? (I never actually touched the money, no checks, no deposits into my personal bank account. I did the rollover and conversion all online through Fidelity’s website). That’s correct. The first one with code G in box 7 is for the rollover from the 401k plan to the Traditional IRA. The second one with code 2 in box 7 is for the conversion from Traditional IRA to Roth IRA. Yes you just enter both in the income section and answer the associated questions. Your Roth conversion isn’t the same as a backdoor Roth (the subject of this post). Really confused for 2018 tax reporting. I’m using the H&R Block online, Premium version. I uploaded the Traditional IRA 1099-R to the software. Now I go to the deductions section (adjustments in your guide), and it wants me to select both Traditional and Roth instead of just traditional. Any updates for 2019 that I’m missing? I recall it was painful last year and I got through it, but I don’t know why it’s roadblocked this year. I just checked the 2018 H&R Block software (installed, not online). No changes from the process shown here. Can you simply unselect Roth in the contribution part? Or if it has to be selected, answer ‘No’ or enter ‘0’ when it asks you whether/how much you contributed to Roth? Installed software usually works better than online. See Tax Software: Buy Download Or CD, Not Online Service. I rolled over all deductible money from a Traditional IRA into my 401k in order to clear the deck for backdoor Roth. I then contributed $5500 to my Traditional 401k and several weeks later converted it to Roth ($5501). I followed your article exactly, but I still end up with $5501 taxable on Form 1040 Worksheet box 4b. I would expect that to be only $1. I’ve also removed the “Taxable” amount from the 1099-R just to see what would happen, and nothing is different. Any idea what might be wrong? Any known bug in the 2018 software? When I changed this to “No” it worked fine. I had converted in the middle of a month, and at the end of tht month $3 of interest posted so at year end 2018 the traditional IRA still contained that $3. I contributed for the 2018 year traditional IRA in January 2019 and then converted to Roth. I thought this would be ok because the amount of money in all my simple/SEP/traditional IRAs was $0 on December 31st 2018. It sounds like my situation is going to be complicated because I also converted a ton of money from my traditional IRA to my Roth IRA in July 2018. Now I do have to calculate basis because of the contribution made in January? Your contribution for 2018 in January 2019 does not affect your conversion in July 2018 when your balance as of December 31 2018 was zero. If the contribution was a non-deductible contribution, you will carry it as basis to 2019. The HR Block steps for 2018 software are not accurate. I’m trying to do a backdoor Roth conversion for my wife for $5500 and yet again this year it is not working properly. I’ve used your site in the past, but you are not displaying the extra page telling me how to “correct” the 2018 excess contribution, yet there are no options I can see to fix this and now my taxable amount has jumped up $2k. There is nowhere that it is allowing to fix this. Any advice is appreciated as always, I love this site each year for this very purpose! These screens were taken from the 2018 H&R Block software installed on my computer. If your scenario matches the example used, following the same steps works, as the screens showed. I didn’t skip any extra pages. Check line 4a on your Form 1040 to confirm how much you are taxed. If it’s not correct, delete all 8606 forms and 1099-R worksheets and start fresh by following these steps. 1. I followed all the same steps as your Traditional IRA, and kept getting fully taxed on the $5500. So i tried a couple other methods, still with no luck. 2. I started over as a “traditional” and when i got to the part about whether it was “recharacterized” i said YES, and entered some Roth info. That ALSO didnt work, kept telling me i was going to be taxed for it. So i clicked “Back” a couple times, said “no” for recharacterization (and left that other info in the system), and then followed the remaining steps… and it somehow magically worked. 3. What i still dont understand is exactly WHEN the system is applying the rule. It doesnt seem to work when i followed your exact steps… and plus, its not really a traditional IRA, but doing it as a Roth doesnt EVER work for this backdoor method… it was saying we owed money every single time since my wife already contributed to a work Roth IRA. I am 95% sure i had to do it this way in 2017 too so it would force the system to do it properly. I wanted to avoid editing the 8606 manually since it would invalidate the filing. Any further thoughts on this? I dont fully trust it but it looks ok now… just a major pain that they dont give you this option in the software as a simple question!! I literally had to do this 6 different times to make it work; the software was not playing nice. It’s better to follow the steps fresh in one pass. If you already put in some wrong answers and you go back and forth to correct them, some of the wrong answers may get stuck somewhere you no longer see. I’m not sure what you meant by “its not really a traditional IRA.” In the scenario used in this post, you contributed to a Traditional IRA and then converted the money from the Traditional IRA to a Roth IRA. The money ended up in a Roth IRA but it went into a Traditional IRA first. Can confirm there’s a problem with H&R block 2018. Line 4a is refusing to calculate properly. I followed your steps precisely. 4a.a was $5500, but 4.b was also $5500 (instead of $0). Redid several times. Did you see the “No IRA Deduction” screen? Make sure you didn’t inadvertently make yourself eligible for a deduction for contributing to the traditional IRA (forgot to check the retirement plan box on W-2; didn’t enter a high enough income yet to put you above the income limit; etc.). Harry- My error – Your instructions were spot on. My mistake was importing from Vanguard (I double imported, once for the 1099DIV and once for the 1099R, but H&R copied all statements twice). Once I followed your instructions to delete and start again, then I manually entered the 1099R data, everything tallied. Once additional note – In Pennsylvania, you’ll need to manually correct the adjusted basis. The H&R software prompts you; if you don’t complete correctly, you’ll see your state taxes owed jump. Your article is the clearest out there and have been referencing it for the past couple of years when entering my taxes. My question is on how to report the removal of excess contribution. I by mistake made the $5500 contribution twice in 2018 and converted both of them from IRA to Roth IRA. I realized this last month and had fidelity remove the excess contribution from Roth IRA. But there was a gain/earning of $427 during that period. The 1099-R that I received earlier has $11000 in gross distribution and taxable amount boxes. How do I report the removal of excess contribution in 2018 H&R Block 2018? Please help if you can. Awesome, clear, succinct advice!!! I don’t think I would’ve gotten this right without your post. Thank you! YOU ARE AWESOME! This helped me soooo much and I learned in the past to do this the easy way as you explain, but walking us through step by step on how to properly enter this in H&R block software was a HUGE help. Thank you so much! Thanks very much for this. I contributed $13k easy way and converted it all. I received a combined 1099-R for me and my wife. The software is current reflecting half ($6,500) as taxable. Any ideas? IRAs are all in individual names. Never heard of a combined 1099-R for two people. Either take a closer look at the forms you received or contact the IRA provider and ask why they didn’t issue a separate 1099-R for each person.